A 23-year-old Palestinian went on a stabbing spree on Wednesday on a bus in Tel Aviv, injuring at least 12 Israelis before being shot and taken into custody, the latest in a series of ‘lone-wolf’ terror attacks in which assailants have used knives, meat cleavers and vehicles as weapons. 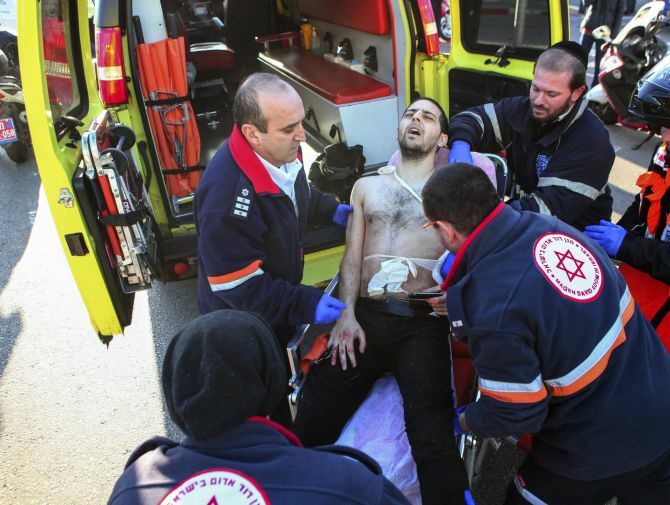 Three of the victims were seriously injured and nine others including the bus driver suffered moderate injuries, a spokesman for the rescue services, Magen David Adom, said. Pictures released by the police showed a large knife lying on the ground. 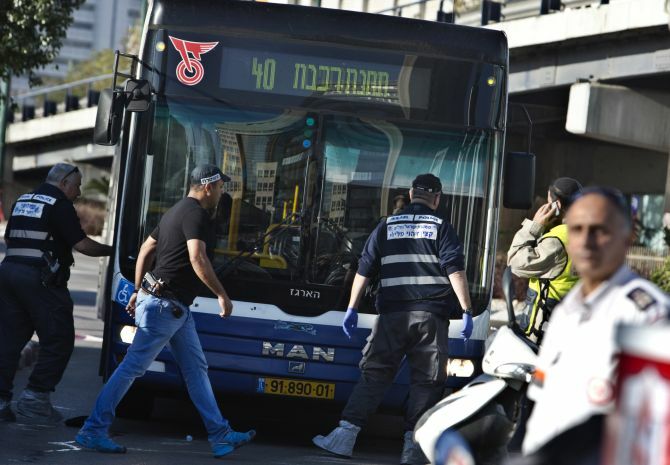 The stabbing attack took place on a bus on Menachem Begin road, a major thoroughfare in south Tel Aviv. The attacker tried to flee the scene on foot but he was chased and shot in leg by a passing prison officer. He was taken to hospital and is being questioned. The assailant is a 23-year-old man from the West Bank city of Tulkarm, illegally residing in Israel, police said. Israel’s Internal Security Minister Yitzhak Aharonovich said that the “terrorist was in Israel without a work visa”. The stabbing is being treated as a “terror attack,” Israel Police foreign press spokesman Micky Rosenfeld said. Meanwhile, Islamist Hamas, which controls the Gaza Strip and whose charter vows complete destruction of Israel, hailed the stabbing attack on bus commuters as a “heroic act”. “The attack carried out this morning is a bold, heroic act and a natural response to the crimes of the occupation and terrorism against the Palestinian people,” Izzat al-Risheq, a member of Hamas’ political bureau, said. The incident is just one of a series of ‘lone-wolf’ terror attacks in recent weeks as tensions have been rising between Israelis and Palestinians since last June, when three Israeli settlers were kidnapped and killed in the West Bank. In November, five Israelis were killed and several more wounded in a terror attack at a synagogue in the Jerusalem neighbourhood of Har Nof, while an Israeli soldier was killed in a knife attack in Tel Aviv, another Israeli woman was stabbed to death in the occupied West Bank in a separate knife attack.